Wtf? Houston has a college football team? Who outside Texas knew that? I can certainly attest that jjmcillece did *a lot* of work on this, having discussed what he does at some length with him. 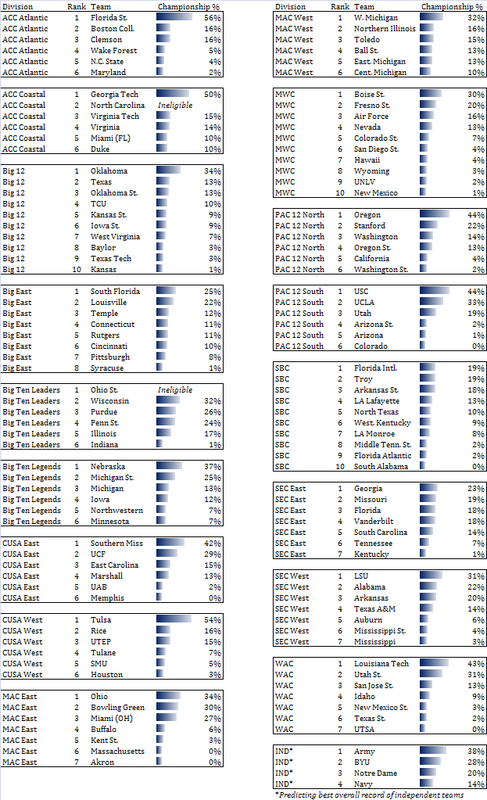 I can’t speak as a diehard NCAA football fan, but only as a data analyst. Odd things happen with data, and sometimes you make a prediction that seems to contradict all sense because of the available data. Why? Sometimes you have a team undergoing big changes in its starting lineup. Those changes can be so different from the vast majority of your observed data, and the best you can do is assume that the team will behave the same way as everything else. It’s like saying that if a 20-year old can run faster than a 10-year old, then a 60-year old can run much faster than the 20-year old. A linear assumption like that is usually dangerous, sometimes it’s clearly stupid, and sometimes it’s the best you can do when you’re a one-man operation working with data in 10+ dimensions. The prediction for Houston might be a result of a bad assumption. Only time will tell for sure. Anybody who analyzes data won’t strongly criticize you for it. I have to agree with the others about Houston. Yes, they aren’t the same, and I do have them losing to UCLA and La Tech. But they don’t play UCF or USM, they have Tulsa at home, and the rest of the East pretty much blows (I’m mystified that so many sites think highly of SMU). Houston has not finished last in 10 years in CUSA. They have had the best recruiting class in 2 of the last 4 years and have the Freshman of the year starting at QB. He is no Case (who is??? ), but will still lead the league in yards and TD’s. We have the best back in the conference also returning and got one of the best wide receiver recruits, Greenberry (a 5 star in Scout). Four of the 5 Offensive linemen are back and the majority of an improving Defense. I am not saying we will win the west, but everyone else predicts us to be 1, 2, or 3. There is NO WAY we finish last in the West. NO WAY. You had better check you advanced methodology and ‘tweek’ it quite a bit. Thanks for the comment. You make good points. Houston had such a tremendous passing offense last year that I saw the losses of Sumlin, Keenum and their top receivers as devastating to the offensive side. Perhaps I overestimated those losses. My CUSA West predictions clearly riled some people up. If they prove to be awful, I’ll acknowledge it after the season. Time will tell, and good luck to the Cougars.